Beginning high in the San Juan Mountains, the Upper Animas starts off as one of the best class IV-V runs the state. Milder and more accessible, the Lower Animas offers a variety of shorter trips closer to Durango. Wilderness Aware Rafting does not operate trips on the Animas River. 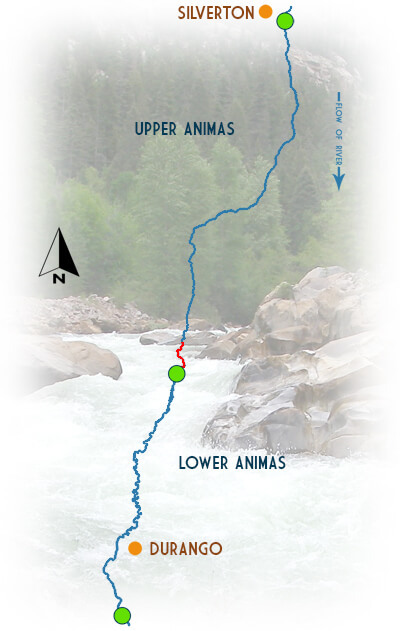 Information regarding the Animas River on this website is strictly informational. Please click here for a complete list of trips that we offer, or use the search filter to the left. Thanks! A fast-paced, continuous and highly challenging section set against the fantastic scenery of San Juan Mountains. A mild whitewater section that is fun and splashy. Close proximity to Durango with gorgeous mountain views. The Animas River is in the San Juan National Forest and is managed by the U.S. Forest Service.